In the long-running debate on renting versus buying, the scales have tipped a little towards renting — at least in Canada’s largest cities. 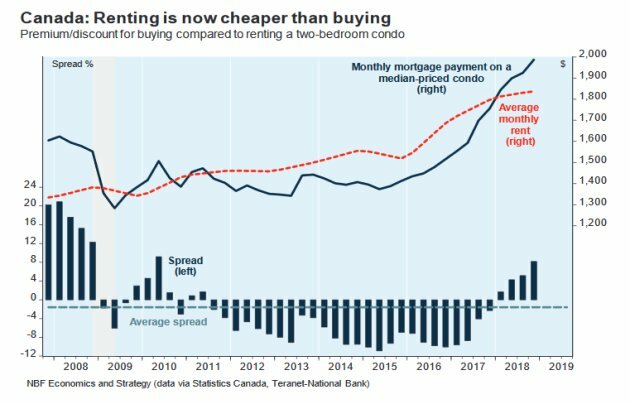 Rapid house price growth a few years ago, combined with rising interest rates today, mean renting has become cheaper than buying on a national level for the first time in years, National Bank of Canada said in a report this week. The report found the mortgage payment on a median two-bedroom condo had risen to around $2,000 in the fourth quarter of 2018, or about $150 more per month than the rent on a two-bedroom rental condo. But that national data hides the fact that things look very different in Canada’s smaller cities than they do in the larger ones. In reality, only in Canada’s three largest metro areas — Toronto, Montreal and Vancouver — is renting cheaper than buying. While both house prices and rental rates accelerated from about 2015 onwards, house prices rose much faster, and mortgage payments left rental rates in the dust. So should you hold off on buying and keep renting? Everyone should do their own calculations, though. With house prices now growing slowly if at all, you may be able to save up a larger down payment for a nicer home down the road. But if renting won’t save you that much, then you may be better off buying a home and building equity in it sooner rather than later, regardless of interest rates. The end of the investor boom? The largest implication here is actually for condo investors who buy properties on mortgage. For this group of people, in many cases it may no longer be possible to cover the carrying costs of a property with income from tenants. A report from Urbanation and CIBC last year found that 44 per cent of Toronto condos taken possession of in 2017 would have lost money as an investment property. Canada Mortgage and Housing Corp. says the same is true for 75 per cent of the high-rise condos in Montreal’s downtown core. Here’s the breakdown of renting costs versus buying costs for the 10 cities covered in NBF’s affordability report.